When it comes to hanging your outdoor banner, the common grommet can easily rip during high winds. What can you use to hold up your banner, whether it’s in the interior of the building or the exterior? With the help of the Banner Ups Starter Kit, you’ll have everything you need to hang your banner, regardless of the size. What’s Included with the Starter Kit? You will have everything you need to finish super strong banners fast! No more hemming or grommeting. The Starter Kit system is easy to use. First, place your Crystal Clear BravoTabs along the corners of your banner. For wide banners, we recommend placing them every 2ft along the middle for additional support. 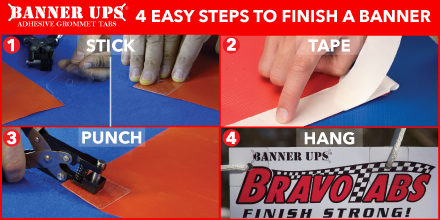 After the Bravotabs are installed run Clear PowerTape along the top and bottom edges of your banner. Finally, punch your holes and run rope. That’s it! No more hassle with grommets or folding double-sided tape. If you have a banner and you’re trying to determine how to hang it, the Banner Ups Starter Kit is exactly the kit you’re looking for. 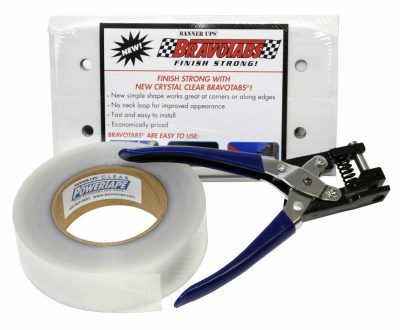 With the help of this kit, you’ll quickly discover just what you’ve been missing. If you have any other banner hanging needs, make sure to check out the rest of what Banner Ups has available. Contact us today!